Google My Business introduces "Special Hours"
We are your Local SEO experts!. We are not those fast talking Marketing “experts” who call and harass you every day and constantly spam your email. We are a dedicated team of marketing professionals that thrive to help business owners succeed online at the local level. We are dedicated to achieving measurable local search goals! Just in time for the Holidays, business owners can now schedule special hours based on holidays or special events. Every business owner knows the importance of an updated and complete Google My Business listing, now you can capitalize this holiday season by sharing special hours to your local customers. Google just announced that business owners will now be able to add special hours to their local listing through the Google My Business interface. These special hours will let local businesses inform their customers about longer or shorter location hours based on the upcoming holidays, or even a special event the business may be holding. “When you provide special hours to Google My Business for a known holiday in your region, we’ll tell your customers that they’re seeing holiday-specific opening hours,” Nordahl said in a release. If you do not provide special hours for a known holiday in your region – even if you update your regular hours – Google will add a disclaimer to let customers know that your “hours might differ” for that holiday. Special Hours are not just for the holidays. 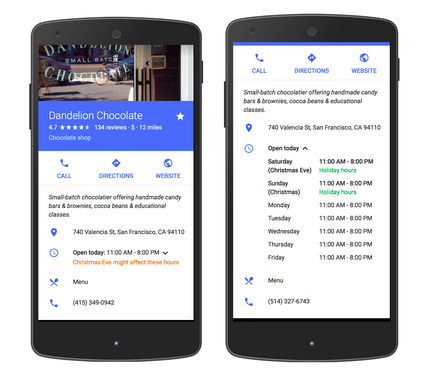 With Special Hours in Google My Business, merchants can pre-schedule exceptional hours up to 365 days in advance. This feature is particularly useful for special events where normal business hours do not apply. Simply use Google My Business to upload with the date with special hours, and Google will display those instead of the regular business hours for that date. No need to return and reload your hours, Google will display your regular hours automatically after the date you specified for your special event. How do I add special hours? Google provides an in-depth help document to Google My Business users in the new feature. But the new feature only works if the business provides regular hours on their listing.